Anyone who has worked with me knows that I'm a maniac for messaging. In today's world, where good is now nowhere near good enough, a solid message is no longer a valuable bonus - it's an absolute must have to compete. The foundation of a great message is a well articulated value proposition. The challenge here is that creating a value proposition that resonates is extremely hard (it's one of the reasons that The INTELLIGENT GROWTH Blueprint process is so valuable). And, even after you've created a powerful message you have to translate that through the words and deeds of your salespeople. It's no wonder businesses overlook these steps - wouldn't just be easier to get in the market and sell? If you realize this challenge, I've got good news for you. 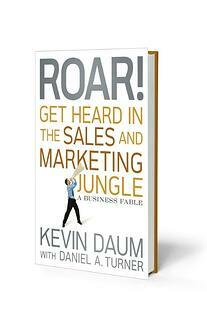 My friend, consultant, advisor, and author, Kevin Daum, is coming out with a new book Roar! Get Heard in the Sales and Marketing Jungle that will lead you and your salespeople to do this successfully. I'll provide a full review when we get closer to the release date (and I'm working with Kevin to have him write a guest post or sit down for an interview). Kevin's a great guy to learn from (I learn from him every time we talk). Kevin gets it - he understands strategy, messaging and the sales process. Most importantly, Kevin understands that theory is nice, but it's profitable revenue that matters. Kevin is offering a free preview of his book (and he's giving away his formula for creating a powerful value proposition - and please know this is must-read stuff). I realize that this sounds like hyperbole, but you'll note I rarely say something is must-read, Kevin's take on creating value proposition is. After reading this portion of the book, we refined our process as a result. Kevin's given me permission to share the preview here, so take advantage and download a copy.